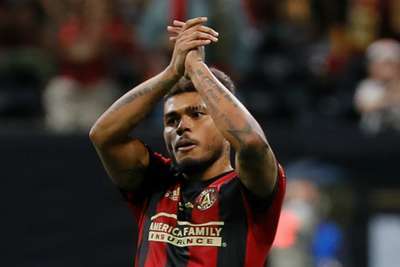 Record-breaking forward Josef Martinez paid tribute to strike partner Miguel Almiron and Atlanta United coach Gerardo Martino after scoring in a 2-0 victory over Portland Timbers in the MLS Cup. Martinez struck in the 39th minute at Mercedes-Benz Stadium and wing-back Franco Escobar notched nine minutes into the second half to ensure Martino, who announced his departure from the club in October, will leave on a high. It was the Venezuelan's 35th strike of a sensational season in which he set a new MLS goals record, and he told reporters the support of Almiron, who has been linked with a move to Newcastle United, and Martino was integral to his success. "It has been a special week for me," said the former Torino striker, who was named the 2018 MLS MVP on Wednesday. "Before the game I had a moment with Miguel and I just thanked him for all the help he's given me over these two seasons. "I want to take this opportunity to thank the coaching staff, the players, the fans, the city. I know it's been a long time since they've won a championship and they deserve it. "When Tata [Martino] called me on the phone the first time and laid forth his plans I was in agreement with everything. I'm thankful for this time I've had with him, even though he's gotten mad at me on a few occasions! "I'm just really grateful and now it's time to enjoy this." Atlanta goalkeeper Brad Guzan took the opportunity to praise the vision of club owner Arthur Blank, who founded the club in 2014 and invested heavily in playing staff and infrastructure. "It just took the right combination of city, of venue, of training ground, of players most importantly," said Guzan. "And it all started with the vision from Arthur. He's the man behind all of this. "He thought that it could prevail: this sport, a team in this city. And it all started with a belief." Club president Darren Eales echoed Guzan's comments about Blank, saying: "At the end of the day, he's the fundamental reason that we're lifting a trophy. "Because his commitment to the city and the credibility gave us that early impulse in terms of fans that bought in because they knew it was going to be credible. "Right from day one I knew he was ultra-serious in terms of what he wanted to do. He brought me in with almost two and a half years to plan for it, so of course that runway really helped us take our time and put together the various pieces. "Arthur's support and mentorship is really the reason we're here today celebrating."